The German Navy frigate FGS Sashen has been damaged in a failed missile launch . During drills off the Norwegian coast, a missile didn’t emerge from the cell in front of the bridge and burned out, causing serious damage to the deck and surrounding area. Two seamen were slightly injured and the frigate headed for Harstad, Norway, for assessment and investigation. A Boeing submarine drone is set to undergo a second round of testing which, if successful, could see the company land a multimillion-dollar contract with the US Navy. The Echo Voyager  is a 51-foot-long autonomous undersea vehicle designed to cruise for months at a time on missions that would be either ‘too mundane or dangerous for human submarine crews to tackle’. The US Navy sees submarine drones as key  to its future naval strategy. HMAS Warramunga is returning home  after a successful seven-and-a-half-month deployment to the Middle East region. During its time as part of Combined Task Force 150, the Australian warship seized a record total  of around 31.8 tonnes of hashish and two tonnes of heroin with an estimated street value of $2.17 billion. European aerospace giant Airbus said that if Britain failed to secure a deal with the EU following Brexit, it might be forced to cease manufacturing in the UK . Britain was the fourth largest exporter  of aerospace products in 2017, behind the US, France and Germany. Meanwhile, the European Commission has allegedly refused to back contingency negotiations  between the UK and EU aviation companies in the event of a ‘no deal’. Turkey’s first two F-35A fighter jets rolled off US production lines on 21 June to great fanfare. The aircraft will be moved to Arizona, where Turkish pilots will begin training  while the other jets are manufactured. That plan could, however, be jettisoned by US lawmakers, who are pushing to block  the transfer of the aircraft from the US to Turkey. Meanwhile, US service leaders said that the air force has begun updating the F-35’s ‘threat library’ —the brains of the jet—with new information about potential enemy aircraft that will help it identify approaching threats. A report from Beijing’s official military portal claims that  China’s J-20 stealth fighter is in the same class as the US’s F-35 and Russia’s Su-30. Though the article’s author, Qin Qian, concedes that China doesn’t have the military experience of the US and Russia, Qin argues  that the J-20 is revolutionising the Chinese air force. The British Army launched its Autonomous Warrior (Land) warfighting experiment  at the Royal United Services Institute land warfare conference in London last week. Autonomous Warrior trials the use of robotic and autonomous systems in ‘last mile’ resupply. The last mile is the final approach into a combat zone, which is crucial to ensuring soldiers have the supplies to keep them alive. Resupply operations can be extremely dangerous . But The Guardian reports that the UK’s defence policymakers are split between tradition and high-tech , suggesting that the nation’s cash-strapped defence policy is unlikely to move too far  beyond proven aspects of conventional warfare anytime soon. While urban warfare training was also highlighted  as a future British Army requirement at the conference, the US Army is taking a different approach to conflict in megacities. The US has pledged $572 million to train its forces  to fight in large-scale subterranean facilities, such as sewers and subways. 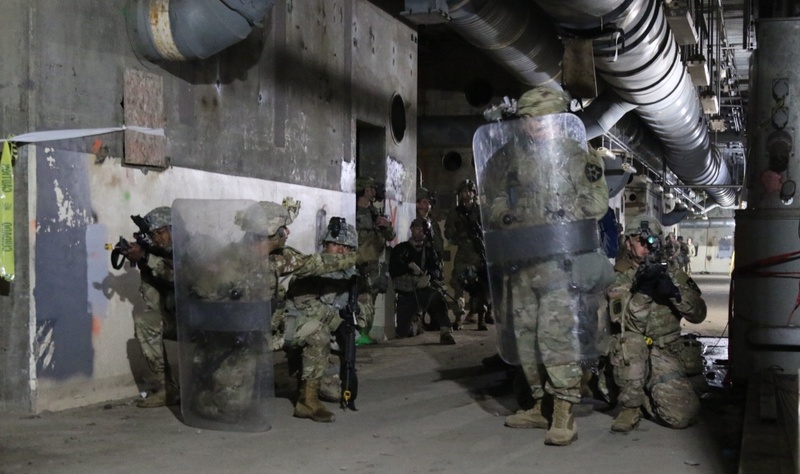 Along with training, troops will also need new equipment to address the underground conditions such as complete darkness, bad and sometimes poisonous air, and lack of cover. Twenty-six of the US Army’s 31 active combat brigades will receive such training, previously only given to tier-one special operations units. China has pledged more than US$100 million in military aid  to Cambodia during Chinese defence minister Wei Fenghe’s visit to Phnom Penh. Wei also met with the commander of Brigade 70—a notorious auxiliary unit charged with protecting Prime Minister Hun Sen that has been the subject of allegations of human rights violations . Coming just weeks before the Cambodian general election and amid a nationwide crackdown on dissent, the assistance arguably bolsters the incumbent regime . India’s notorious air pollution is being monitored by the Sentinel-5P, part of the European Union’s Copernicus earth-monitoring program. The satellite can detect gas traces in the atmosphere , which is important for gathering data to inform health and environmental policies. Developments in satellite technologies mean that emissions data can be collected much more efficiently, taking only a few months compared to the many years it used to take. The International Space Station sent its first spacecraft with space-debris-removal technologies into orbit last week. The RemoveDebris Spacecraft  will use a harpoon to shoot out a net to capture space debris. It’s the largest satellite deployed by the ISS. Thanks to Russian astronaut Oleg Artemyev, you can see a video  of the satellite passing by the ISS. And it’s not just videos that astronauts are able to take while in space. The ‘space selfie’  has become a trend among astronauts, capturing the unique experience of being in space. Although a bit of fun, space selfies could be used to generate interest among younger generations in a career in space. Maybe a useful strategy for Australia’s new space agency to consider? As cybersecurity threats evolve with changing technologies, it’s important for governments to adopt strategies that keep up. According to the UN International Telecommunication Union’s 2017 Global Cybersecurity Index , only 38% of the ITU’s 194 member states have a published cybersecurity strategy and only 11% have a dedicated standalone strategy. So, what should a cybersecurity strategy include? Mark Micallef, software company Cloudera’s vice-president for the Asia–Pacific and Japan, has some tips, focusing particularly on the protection of critical infrastructure . China has deployed birdlike surveillance drones throughout the Xinjiang Uyghur autonomous region  in the country’s west. The drone replicates around 90% of the movements of a dove, effectively evading human detection and radar, and is so lifelike that birds fly alongside it. While the drones are currently vulnerable to electromagnetic disturbance , the program is to be expanded for large-scale use in the future. The US has accused Qin Shuren, a Chinese national living in Massachusetts, of smuggling submarine detection devices  into China. Prosecutors allege that he exported 78 hydrophones (devices that can be used to monitor sound underwater) to Northwestern Polytechnical University, which they describe as a Chinese military research institute. Because of national security concerns, companies need an export licence to ship US goods to the university, which has close links to the People’s Liberation Army. Christopher Dixon, Jessica Clarence, Amelia Meurant-Tompkinson and Melissa Liberatore are research interns at ASPI. Image courtesy of the US Army.